Izumi Nakamitsu, UN High Representative for Disarmament Affairs, addresses the Security Council debate on non-proliferation of weapons of mass destruction. Some argue that disarmament is not the right issue to negotiate when the international security environment is deteriorating. “We counter that argument,” Ms. Nakamitsu, the newly appointed High Representative for Disarmament Affairs, told UN News, stressing that “disarmament matters” even more so in times of high tensions over security issues. Disarmament is all about preventing major catastrophes in times of conflict. Her appointment also came at a critical phase of nuclear disarmament. UN Member States are negotiating a treaty on the prohibition of nuclear weapons, with the talks scheduled to conclude on 7 July. To date, however, a number of countries are staying out of the negotiations, including the United States, Russia and other nuclear-weapon States, as well as many of their allies, including Japan. The Democratic People’s Republic of Korea has not joined the talks either. Ms. Nakamitsu also spoke about the ongoing stalemate in the Geneva-based Conference on Disarmament, her goals for her first 100 days in office, and advice for women aspiring to senior UN leadership positions. UN News: The Secretary-General has made conflict prevention one of his top priorities. How does the disarmament agenda fit into this picture? Izumi Nakamitsu: Disarmament is all about preventing major catastrophes in times of conflict. Everything we do in disarmament negotiations and discussions needs to fuse into the prevention agenda. What we are doing has an enormous preventive effect. Disarmament is also part of a political solution to the conflict. It helps decrease tensions, create space for dialogue and build trust and confidence. We counter the argument that when the international security environment is deteriorating or tensions are increasing, disarmament is not the right issue to be put on the table. Rather, because the security environment is difficult, we have to talk about disarmament. It has preventive and trust-building effects. It has to be part of a political solution to any dispute or conflict. UN News: Disarmament is a politically charged subject. How do you intend to deal with this issue? Izumi Nakamitsu: Yes, it is politically sensitive and challenging. But the kind of work we do at the United Nations is always very challenging and politically sensitive. So the role we are expected to play is to build bridges between different political positions of Member States, give sound advice at the technical and substantive level, and make sure that Member States negotiating those very politically charged issues will be able to find their own solutions and find common ground. Political difficulty is just part of our job. And if I could add, that’s why it is an exciting type of work. UN News: The United Nations Conference to Negotiate a Legally Binding Instrument to Prohibit Nuclear Weapons is under way. What is the expected outcome? Nuclear-weapon States, many of their allies and States such as the Democratic People’s Republic of Korea are missing from the negotiations. Does the absence of these States in the talks undercut the outcome? Nuclear-weapon States and some of their allies are not able to join the negotiations at the moment, but hopefully a treaty will be something they will be able to join eventually. Izumi Nakamitsu: Through a resolution, the General Assembly mandated Member States to negotiate a treaty. It is ongoing, so I can’t really say what kind of treaty it is going to be. Member States are working very hard to conclude the negotiations by the 7 July deadline. It is true that a number of countries decided to stay out of the negotiations. Because which negotiations they will participate in or not is a decision made by those individual Member States, there is nothing we can say about it. But as the Secretariat, we’ve been advising Member States that are part of the negotiations that if they want to have the objectives of nuclear disarmament, then a treaty will have to be something that will become inclusive in the future. Nuclear-weapon States and some of their allies are not able to join the negotiations at the moment, but hopefully a treaty will be something they will be able to join eventually. The door must be open to all States. This inclusiveness will have to be built into the treaty. I hope concerns expressed by non-participants will be taken into account by those negotiating the treaty. UN News: The Geneva-based Conference on Disarmament (CD) has not produced any concrete results since 1996. How can you help break this deadlock? Izumi Nakamitsu: The Conference on Disarmament has been in stalemate for the past 20-plus years. I was in Geneva recently. I sensed that the frustration of not having produced any substantial results is shared by many Member States that are part of the body. As a result of this shared feeling that something has to happen, there is now a working group on the way ahead. Member States are beginning to engage in a process of putting their heads together and find an option on how to move forward. I advise all Member States involved to think outside the box and to be creative and innovative to find common ground. They still consider the CD to be an important instrument. I will definitely support the efforts of Member States. UN News: Disarmament is more than just nuclear disarmament. Can you briefly explain other aspects of work undertaken by the UN Office for Disarmament Affairs (UNODA)? Izumi Nakamitsu: Nuclear disarmament remains important, with the nuclear weapons prohibition treaty being negotiated at the moment and the preparatory process having started for the 2020 Review Conference of the Parties to the Treaty on the Non-Proliferation of Nuclear Weapons (NPT). We are in a critical phase of the overall nuclear disarmament issue. The vast majority of the victims today get killed by conventional weapons, especially small arms and light weapons. But we also have a very acute, priority agenda in the area of chemical weapons. Chemical weapons use in Syria is one of the priority agendas not just for my office but also the Security Council and the international community. We have a very strong comprehensive Chemical Weapons Convention, but the taboo against chemical weapons use is unfortunately being undermined. We have to make sure that this norm is restored so that no chemical weapons use is allowed, and if it is violated, we have to bring perpetrators to accountability. We also have the Biological Weapons Convention and a number of different disarmament treaties. We need to make sure that proper implementation and well-functioning of these instruments continue. We have some financial issues with some of these, to which financial health must be brought back. Conventional arms and light weapons is the area where we can demonstrate much more in terms of real impacts on the ground. The vast majority of the victims today get killed by conventional weapons, especially small arms and light weapons. This must be definitely highlighted as it has a direct link to what the UN does in its peace operations, etc. We work with governments to assist their capacity-building in these areas, including ways to improve the safety and security of ammunition stockpiles in order to avoid accidental explosions and diversion of ammunition. The area I’m very interested in, and the Secretary-General is keen on, is what he calls ‘frontier issues.’ Those include cybersecurity and artificial intelligence. Cyberattacks have become a regular occurrence. We need to make sure that these new issues, closely related to rapid technological and scientific development, will become a top priority of Member States. They are now addressing these concerns at the expert level but our work must also be accelerated and intensified in this area. So disarmament has many dimensions. I hope, through some of our efforts in disarmament education, the public, especially younger people, will have a comprehensive understanding of what constitutes the disarmament agenda, which is very complicated and multifaceted. UN News: You started your current position in May. What would you like to accomplish in your first 100 days and during your term? Izumi Nakamitsu: I’m new to disarmament. So for the first 100 days, my ambition is to fully understand the disarmament file, a hugely complicated area with a lot of technical details. I already began to understand the political side of the issue, but within 100 days I would like to understand those technical details and have a better knowledge of all areas of disarmament. During my tenure? Well, I’m sort of a humble person. I don’t have catchy words to characterize my ambitions for the medium or longer term. But there are a couple of things. The international security environment is very difficult at the moment, but I would definitely like to achieve a political understanding among most of the Member States of the UN – that because it is difficult, disarmament matters. And the second is sort of a creation of the political will at the level of the Member States. I would very much like to have some sort of a vision of the international community for disarmament in the 21st century. There are new issues like cyber (security), artificial intelligence, etc. Disarmament is actually one of the oldest mandates of the United Nations – it goes back to the founding of the United Nations. We have a unique place in the UN. But I think it will also be really good if we can bring disarmament into the 21st century, and understand the new issues that the international community has to grapple with and the priority and sequence of the issues that we have to put our heads together to create a safer and more secure world. That is what disarmament is all about – it is about making the world a safer, more secure place. UN News: The Secretary-General is committed to achieving gender parity in senior management appointments. What is the significance of a woman leading UN disarmament affairs? Izumi Nakamitsu: I’m the second female to head the UN disarmament office. I never actually thought about it. At the professional level, I don’t think it makes much difference if you are a man or woman leading an office in any field. The important thing is that whoever is most qualified, men or women, should be doing the job. That’s what the message should be. UN News: Can you speak a bit about the strengths women can bring to disarmament? Izumi Nakamitsu: I don’t usually generalize things. I have worked in the field and met female snipers. You cannot necessarily say women are peace-loving. But women’s soft-spoken style or gentle approach may make a difference when tensions are high. I have always been able to speak to the most difficult people in those situations. I think it was partly because I am a woman. I showed up at negotiations at the country or local levels or at checkpoints; commanders were not expecting that a woman would show up to negotiate with them. The area of peace and security, including disarmament, tends to be still a bit dominated by men, as many people used to come with military backgrounds. But it’s changing. What we do at the UN is political work. So if you are interested in peace and security, and a woman, the door is wide open for you. UN News: Do you have any advice for women aspiring to senior UN leadership positions? Izumi Nakamitsu: Work hard. If you are working hard and doing a good job, have a trust in the system that there are always people who are watching you and appreciating your work. Think about how to excel in your job. UN News: How does your previous experience in the Department of Peacekeeping Operations (DPKO), the UN Development Programme (UNDP), the Office of the UN High Commissioner for Refugees (UNHCR) and other parts of the UN system help you in your current post? Izumi Nakamitsu: Many different ways. I’m happy to have done all these different areas of work. Definitely for one thing, the network of people I have across the UN system is useful. Everywhere I go, I usually know people. That helps because if I need to do something or move a difficult file, I can always call up different people and ask them to give me advice. But more substantively, because of my years of experience in different fields, I really understand the close linkages between conflict, peace and security, humanitarian affairs and development, and how we need to look at these things more comprehensively to find a solution. One often-talked-about weakness within and beyond the UN system is working in silos. UN News: Being a national of Japan, the only country to have suffered nuclear attacks, is there anything you can do to advance the disarmament agenda? Izumi Nakamitsu: Hibakusha, survivors of nuclear bombs, have been courageously sharing their stories and experiences. That has really moved a number of very influential actors in the international peace movement and across civil society around the world. They have not just kept nuclear disarmament discussions alive, but created additional momentum. Whenever I talk about nuclear disarmament, I always try to refer to their heroic and tireless efforts. I can be a messenger who spreads their words around the world through my work at the UN as well as convey voices I pick up from the international community back to Japan. 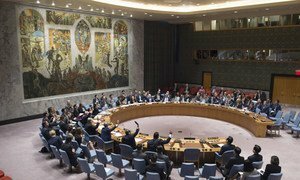 Strongly condemning the nuclear weapons and ballistic missile development activities of the Democratic People's Republic of Korea (DPRK), the United Nations Security Council today decided to apply existing sanctions to 14 individuals and four entities.